Pilates is an internationally recognized movement philosophy and method designed to strengthen and lengthen the body. Exercises are typically performed lying down before challenging the client through the gravitational forces that occur in sitting, kneeling, or standing making it an excellent tool for patients and clients of all levels1. Although Joseph Pilates began developing over 500 exercises in the late 1800s, the research behind the success of Pilates as a rehabilitation technique is relatively new. There is already strong evidence that Pilates improves flexibility and dynamic balance and moderate evidence that it improves neuromuscular endurance in healthy subjects2. However, emerging studies have become more inclusive and support Pilates across many populations including low back pain, hip replacement, knee replacement, stroke, fibromyalgia, cerebral palsy, amputee, multiple sclerosis (MS), osteoporosis, breathing dysfunction, and balance dysfunction. For this reason, Magee’s own staff Physical Therapist and 450 hour comprehensively certified Pilates Instructor Sarah McMahon, PT, DPT focuses on incorporating Pilates into all of her patients’ sessions. 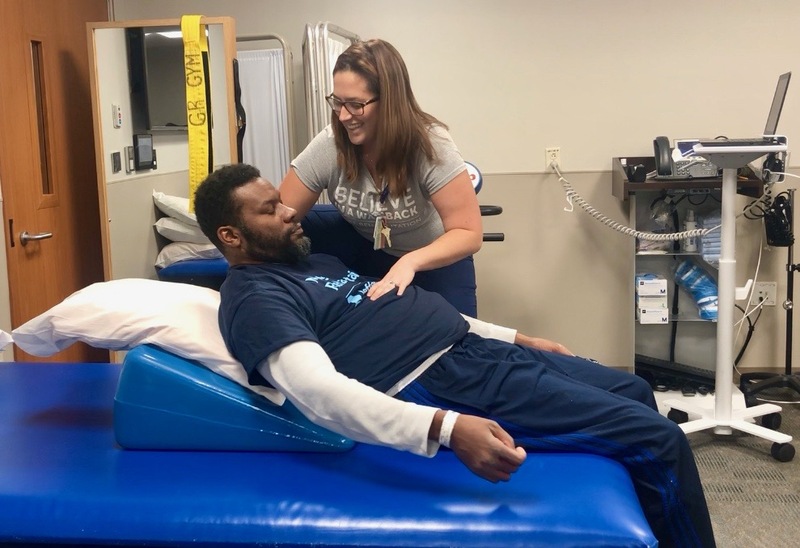 In honor of MS Awareness Month, Sarah is sharing how the use of classical Pilates exercises helped former patient Larry Thompson achieve his goals. While at Magee, Larry wanted to regain his independence transferring in and out of his wheelchair, a skill 19% of people with MS will be required to do at some point in their lifetime3. Like many patients with MS, Larry was sometimes limited by his fatigue level and shoulder pain caused by weakened core muscles that compromise sitting posture3. Sarah began incorporating Pilates-based breathing techniques and exercises focused on the abdominals and postural control. Sessions typically began with Larry breathing in through his nose and out through his mouth, as if fogging a mirror. Sarah provided hands-on facilitation to improve expansion of the rib cage and verbal cues to control the length of each breath. From there, Larry would perform a modified Pilates roll up, progressing through various ranges across sessions, eventually adding a modified Pilates crisscross while reaching for a bean bag. In the video below, you may notice how the repetitions where the movement appears easier and more controlled are when it is properly coordinated with the breath. As a result, Larry is able to improve abdominal activation with decreased use of compensatory strategies. Each subsequent repetition also led to a more erect posture and balance when throwing the bean bag at a target. Throughout the session, Sarah corrects mistakes and uses tactile stimuli which has been proven to increase body awareness and contribute to balance development during Pilates2. To continue improving the flexibility and control of Larry’s spine, they later incorporated a modified Pilates spine twist. Pilates exercises performed with spinal rotation are introduced later in sessions, since it requires increased body awareness and control to perform properly. It wasn’t long before they both noticed that Larry was improving his shoulder pain, balance, and strength following these exercises, resulting in less assistance with his transfers, especially when carrying over the same breathing technique into these tasks. This success matched a handful of research articles on Pilates for MS that showed clinically meaningful improvements in walking performance, balance, functional mobility, muscle strength at the lower limb joints, fatigue severity, core stability, quality of life, cognition, posture, neck and shoulder pain, and flexibility, following 8-12 weeks of mat Pilates sessions with and without other equipment1-7. All subjects had mild symptoms except for those in one study using people with severe symptoms requiring a wheelchair, supporting that Pilates is for any body! As valuable as Pilates can be, it is just one rehabilitation tool for patients with MS. Both Pilates and aquatic training have been shown to increase dynamic balance by 36.3% in patients with MS7. Additionally, the combination of Pilates and aerobic activity has been shown to significantly improve fatigue management and protect the nervous system on a physiological level6. The goal of this article is to simply improve awareness of the Pilates method as a rehabilitation tool to patients and providers as research emerges and suggest using Pilates in conjunction with other exercises methods. Magee hosts MS support groups on the second Wednesday of each month at noon on the 3rd floor. At the meeting on May 8, Sarah will offer a guest lecture, sharing more of her knowledge of Pilates for MS and lead simple exercises that can be practiced at home. To participate, contact Kaitlin O’Sullivan at 215-587-3106 or kaitlin.osullivan@jefferson.edu. Editor’s Note: The material contained in this blog is provided for educational and informational purposes only and is not intended as medical advice. Always consult your doctor before beginning any exercise program. Bulguroglu, I., Guclu-Gunduz, A., Yazici, G., Ozkul, C., Irkec, C., Nazliel, B., & Batur-Caglayan, H. Z. (2017). The effects of Mat Pilates and Reformer Pilates in patients with Multiple Sclerosis: A randomized controlled study. NeuroRehabilitation, 41(2), 413-422. Guclu-Gunduz, A., Citaker, S., Irkec, C., Nazliel, B., & Batur-Caglayan, H. Z. (2014). The effects of pilates on balance, mobility and strength in patients with multiple sclerosis. NeuroRehabilitation, 34(2), 337-342.
van der Linden, M. L., Bulley, C., Geneen, L. J., Hooper, J. E., Cowan, P., & Mercer, T. H. (2014). Pilates for people with multiple sclerosis who use a wheelchair: feasibility, efficacy and participant experiences. Disability and rehabilitation, 36(11), 932-939. Duff, W. R., Andrushko, J. W., Renshaw, D. W., Chilibeck, P. D., Farthing, J. P., Danielson, J., & Evans, C. D. (2018). Impact of pilates exercise in multiple sclerosis: a randomized controlled trial. International journal of MS care, 20(2), 92-100. Kara, B., Küçük, F., Tomruk, M. S., & İdıman, E. (2017). Different types of exercise in Multiple Sclerosis: Aerobic exercise or Pilates, a single-blind clinical study. Journal of back and musculoskeletal rehabilitation, 30(3), 565-573. Alvarenga-Filho, H., Sacramento, P. M., Ferreira, T. B., Hygino, J., Abreu, J. E. C., Carvalho, S. R., … & Bento, C. A. (2016). Combined exercise training reduces fatigue and modulates the cytokine profile of T-cells from multiple sclerosis patients in response to neuromediators. Journal of neuroimmunology, 293, 91-99.